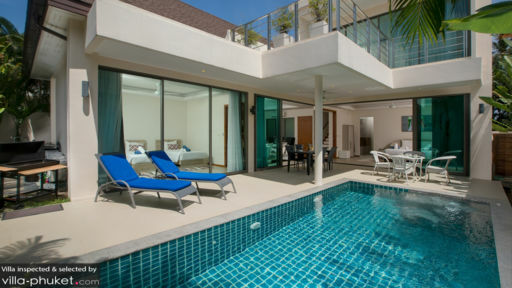 Villa Raja is a two storey four bedroom villa located very near the tranquil Nai Harn Beach on the island of Phuket, Thailand. You, your family, and friends, can have a fun time swimming in the pool, lounging on the comfortable sofa, or restaurant hopping as various dining choices are within walking distance of the villa. Here at Villa Raja, you can have a peaceful tropical island getaway. Come and have a great holiday here at Villa Raja! Located on the second floor is Villa Raja’s master bedroom, perfect for couples. The master suite is equipped with a king size bed that will make you want to stay in bed all day long. The best part of the suite is the balcony where you can spend early mornings looking out at the mountains in the distance, enjoying the peaceful atmosphere. The bedroom also comes with an airy en suite bathroom. There are three clean and spacious bedrooms in Villa Raja. There are two guest bedrooms on the ground floor. Both of these bedrooms have a view of the pool and garden area. Both of the rooms are air conditioned and have comfortable mattresses to ensure that you have a full night’s sleep. The third guest bedroom is located on the second floor, with its view of the outdoors. No matter which room you decide to sleep in, the clean, bright, and spacious interiors of each bedroom will help you get much needed rest. 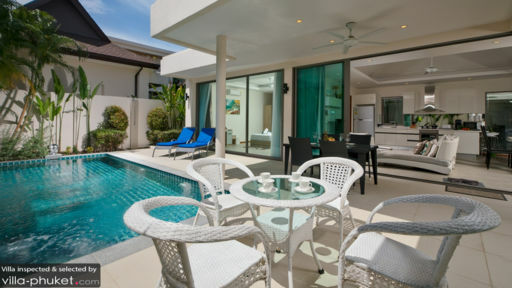 You can have a lovely time outdoors in Villa Raja’s outdoor and pool area. Spend a lazy afternoon swimming in the villa’s pool or lay back and sip on a cool refreshing drink on one of the two sun beds. If you stay in the master bedroom, you can enjoy the view of the mountains and greenery beyond from the balcony. If you plan on renting a car, there is also parking space available. 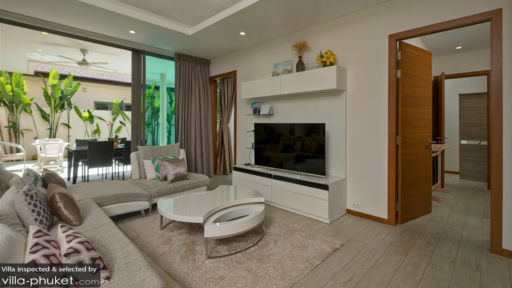 Here at Villa Raja, whether you’re coming from a morning spent outdoors in the pool or by the beach, you can always find peace and comfort in its bright airy open plan living space. Here, the lounge, dining, and kitchen are combined to create a relaxed setting that will allow for some good times with family and friends. The dining area comfortably seats six people while the modern kitchen, with its sleek white finishings, is equipped for you to create delicious meals. The lounge area, with its cushy couch and TV, will be a good space in which to spend your afternoons. The staff here at Villa Raja are friendly and will ensure that your stay is comfortable and enjoyable. There are a few services and amenities offered here to make your stay even more comfortable. You will receive a welcome pack the staff has prepared for you when you arrive at the villa. There is also WIFI all throughout the villa so you can browse with ease, while relaxing on the sun bed by the pool or on the couch in the living area. Villa Raja is a peaceful haven located in Phuket, Thailand. The villa itself is situated in a peaceful compound of private villas. Nai Harn Beach, which is popular amongst those who live on the island, is a 15 minute drive away. Along Nai Harn Beach, you’ll find a handful of hotels and a few restaurants as well. However, should you want to eat out for dinner or lunch, there are a bunch of restaurants offering various cuisines within three minutes of the villa. There are also a number of supermarkets as well as a massage place near Villa Raja. I highly recommend the villa for relaxation, honeymoon & sea food , its close to the Rawai fish market that you can get any type of fish with reasonable price and get it in any restaurant in the market.